I climb the stone steps, still warm with the heat of yesterday. Opening the door to the roof terrace, Habibi and I emerge into the coolness of a desert morning. Just before dawn. 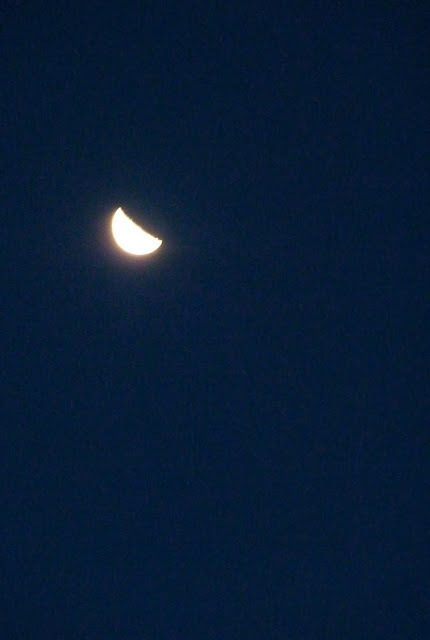 The Moon hangs high in the sky, waiting for her partner the Sun. I lift Habibi into my arms and sit comfortably in a wrought iron chair. I lift a cup of freshly brewed coffee to my lips. The day is about to begin. The cupolas across the street begin to reveal themselves. The first light of the day creeps toward the horizon. A chill comes over me as the light begins to change. The cool night air lingers, still caressing my skin. This time of day is special. Habibi snuggles closer into my neck. It's comforting. I sit in silence and awe as the sky changes. "We can only appreciate the miracle of a sunrise if we have waited in the darkness." "The grand show is eternal. It is always sunrise somewhere; the dew is never dried all at once; a shower is forever falling' vapor is ever rising. Eternal sunrise, eternal dawn and gloaming, on sea and continents and islands, each in its turn, as the round earth rolls."